This is the second installment of two blogs authored by some of our visiting international honors students. Because of their academic excellence, these students’ study abroad experiences at Minnesota State University, Mankato have been sponsored by a variety of American or international agencies. We invite a select number of them to participate in our Honors Program while they are enrolled at Minnesota State Mankato. While here, the students can enroll in honors courses and participate in any number of honors activities. Doing so is a great way to meet other Americans and to get involved in the community at a deeper level than might otherwise have been possible. In these blogs, Yusra and Jilly reflect powerfully on their experiences in and outside of the classroom. It has been a joy to have them as part of our community, even if for a short while. I have found studying abroad to be one of the best ways to enhance my experience. I was pretty excited when I was selected for the cultural exchange program to spend one semester in the United States. I did not know which school I was going to attend because it was my sponsor’s decision. 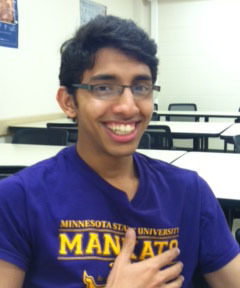 After a lot of waiting, I found myself here at Minnesota State University, Mankato. I was already prepared for a fun semester but another surprise was in store for me. At the orientation, I was told that I was one of the students who had been selected to join the Honors Program during my stay. One of the courses the Program offered, Honors American Indian Leaders, was the main reason I accepted the invitation. I have always been interested in Native American history so I was excited for the opportunity to take this course through my enrollment in the Honors Program. My semester-long experience is coming to a close, but I have really enjoyed being a part of this wonderful group. I have met a lot of new people, including my classmates in Honors American Indian Leaders, and Professor Rhonda Dass. Together we have learned so much about American Indian leadership and culture from Dr. Dass and enjoyed the unique layout of this course. We often meet outside of the classroom at various restaurants for class, and the majority of our time together is based on class discussion. The environment in the class is entirely different from any I have ever experienced in my own country, Pakistan. By being a part of this program, I have had the opportunity to attend events that I might never get the chance to attend again. In my honors course, Dr. Dass encouraged me to attend the annual Pow-Wow held at the Land of Memories Park here in Mankato. I got a first-hand experience of Native American culture by attending the Pow-Wow that commemorated the 38 plus two Native Americans who were publicly executed during the US-Dakota War. Another cultural event I was able to attend through my honors course was American Indian Night put on by the University’s American Indian Student Association (AISA). My classmates and I also organized and hosted a dinner for the student leaders of AISA. These were wonderful opportunities to grow culturally and meet new people. Being a part of the Honors Program has been a wonderful experience. It has changed my perspective on a lot of things. It has given me the opportunity to interact with people from a different culture and allowed me to look at the world from a different perspective. I am really lucky to have been a part of this program, and I am very thankful to MNSU and my sponsors for this opportunity. I will surely miss all of this. 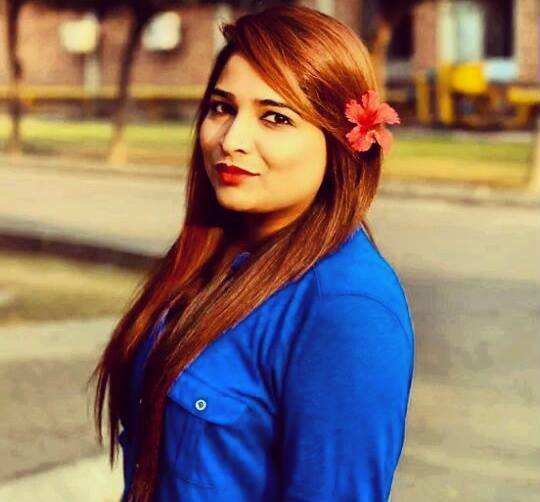 Yusra Hayat studied at Minnesota State last school year as a visiting international student from Pakistan. As part of her involvement in the Honors Program, she wrote a reflection for the Spring 2014 Honors Beacon newsletter. She updates us on her return to her home country as she reflects on her experience. I did not go to the United States to create a new world of my own. I went there to get a taste of the world there and cherish what was here in my home. I went there to not only change misinformed perspectives both cultures have of each other but also incorporate the things I truly valued in the US culture—friendships without age barriers, pervasive common courtesy, and time management—into my own home. Now that I have come back full circle, there is a terrible uneasiness mixed with a certain degree of maturity. I know that I have to bid good-bye to every chapter as it closes in my life, but this one proved to be harder than I thought. It’s not merely the feeling of saying goodbye to America or to all the traveling that I did. It’s not the gentle snow, the absolute greenery or the overdose of MSU purple and gold. It’s the warmth of humanity and selflessness, it’s loving without falling in love. As Toni Morrison said, “it’s rising in that feeling.” It’s the fear that a “routine’’ and “the usual’’ will not hold the same meaning anymore; the fear that life does go on and nothing happens when people leave; the certainty that everyone gets so engulfed in weaving the fabric of their remaining lives that the intricacy of the initial pattern and its significance gets lost to each one of them. But most of all, it’s knowing that the next time I sit with the people I cherished in the US, we will all take the seven individual chairs instead of sitting huddled together on a dirty beige sofa. We will smile at each other remembering old jokes instead of laughing like young hysteric souls because the noise of that laughter is lost with time, and space has created new definitions of “routine” and “the usual” for each one of us. The USA is so diverse that apart from learning cultural sensitivity, I’ve learned how to see individuals as people first and as their defined roles second. My mother was always absent from my childhood play performances and my shopping trips. She was never present at my celebrations or the various transitions in my life. I always felt that she was never there because she had other priorities. After this semester, I have allowed myself to see her actions in a new light. Earlier, I jettisoned all that was so dear to her. Now I am able to comprehend that she was not an ordinary mother and that she was working two jobs to give me a future she never had a chance to live. Most of all, I understand her love for me. The transition back into the world I had left took its own sweet time and I let it pass with difficulty because I wanted to indulge in the pain while it mattered. I wanted to slowly open the sense of loss and mourn it while it lasted. I wanted to relive our random drives and lake plans, late night walks to get sodas and pops, our library Sundays and our genuine happiness without a care for the world because it was honest. Because it was precious. Because the people there didn’t have to. Because we weren’t friends to begin with. Because we had our own lives without each other. Because then my friends became family and a small college town became home. I put all the pictures up in my room and make it home, and then it did become that, and then life wrenched me away so quickly and suddenly that I found it hard to gel back so naturally again. I have a beautiful family and amazing friends but then I wonder how do I gather my soul that hovers in so many places and with so many people where I enjoyed myself the most and assimilate it and hold it all together? Yes, life lacks the neat closure of a conventional story, but it isn’t even about closure anymore. It’s about not knowing how to unite your three different lives and your three different homes and your three different identities stacked away in Karachi, Lahore, and Minnesota. When they say go full circle back to your home base, where do you go?